Here’s a trial-and-error technique — an exploration activity — that is within the grasp of Algebra II students. It’s simple to understand; it’s just a lot of work. This approximation is accurate to five decimal places. By now, I’d imagine that our student would be convinced that logarithms aren’t just a random jumble of digits… there’s a process (albeit a complicated process) for obtaining these decimal expansions. Of course, this process isn’t the best process, but it works and it only uses techniques at the level of an Algebra II student who’s learning about logarithms for the first time. If nothing else, hopefully this lesson will give students a little more appreciation for their ancestors who had to perform these kinds of calculations without the benefit of modern computing. I’ll give the real answer that question later in this series. That said, students can also perform this computation by creatively using their handheld calculators. Most calculators will return an overflow error if a direct computation of is attempted; the number is simply too big. A way around this is by using the above approximation , so that . Therefore, we can take large powers of without worrying about an overflow error. and a hand-held calculator can be used to show that this expression is approximately equal to . Some of the last few digits will be incorrect because of unavoidable round-off errors, but the approximation of — all that’s needed for the present exercise — will still be evident. 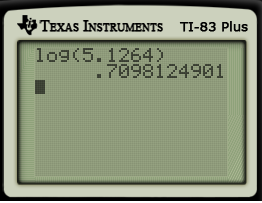 Since hand-held calculators will generate identical outputs for these two expressions (up to the display capabilities of the calculator), this may lead to the misconception that the irrational number is actually equal to the rational number , so I’ll emphasize again that these two numbers are not equal but are instead really, really close to each other. A lot of patience multiply by itself repeatedly in a quest to find integer powers of that are close to powers of . While I don’t have a specific reference, I’d be stunned if none of our ancestors tried something along these lines in the years between the discovery of logarithms (1614) and calculus (1666 or 1684).